Eamon Dolan/Houghton Mifflin Harcourt, 9780544085114, 320pp. By the age of nine, Taylor Wilson had mastered the science of rocket propulsion. At eleven, his grandmother’s cancer diagnosis drove him to investigate new ways to produce medical isotopes. And by fourteen, Wilson had built a 500-million-degree reactor and become the youngest person in history to achieve nuclear fusion. How could someone so young achieve so much, and what can Wilson’s story teach parents and teachers about how to support high-achieving kids? 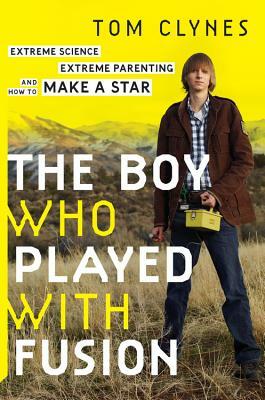 In The Boy Who Played with Fusion, science journalist Tom Clynes narrates Taylor Wilson’s extraordinary journey—from his Arkansas home where his parents fully supported his intellectual passions, to a unique Reno, Nevada, public high school just for academic superstars, to the present, when now nineteen-year-old Wilson is winning international science competitions with devices designed to prevent terrorists from shipping radioactive material into the country. Along the way, Clynes reveals how our education system shortchanges gifted students, and what we can do to fix it. TOM CLYNES writes regularly for National Geographic and Popular Science, where he is a contributing editor. His work has also appeared in Men's Journal, Nature, New York, the Sunday Times Magazine (London), the Washington Post, and many other publications. He is also the author of the book Wild Planet! "Imagine if cartoon whiz-kid Jimmy Neutron were real and had a brainchild with MacGyver and his adolescence got told as a rollicking bildungsroman about American prodigies and DIY nuclear reactors—well, that’s this book." --Jack Hitt, author of Bunch of Amateurs.